Subject : Andhra Pradesh Capital City Name as NTR Nagar as Gujarat's Gandhi Nagar ? ? ? K C Sivaramakrishnan Committee Suggestions Regarding what to be Next and New Capital City For New Formed Andhra Pradesh ? The K C Sivaramakrishnan Committee, appointed to suggest possible options for location of the new capital, submitted its report to the Centre last week but did not pinpoint any particular city or area. The Chief Minister N Chandrababu Naidu is the Final Key for Declaration and advised his Cabinet colleagues not to speak anything on the capital issue as he himself was expected to make a statement in the Assembly tomorrow. Earlier, the Government decided to set up an Temporary capital in Vijayawada till a permanent location is identified But the Sivaramakrishnan Committee did not favour it. 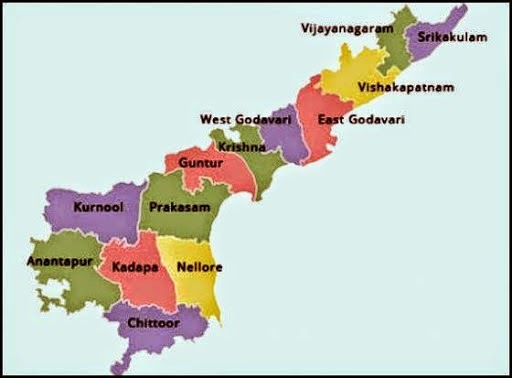 The Cabinet reportedly opined that Vijayawada would be the ideal location for the new capital given its central position in the State's geography. The Cabinet decided to constitute a committee headed by senior Minister Yanamala Ramakrishnudu for acquiring land for the new capital. And some of the Ministers are proposing the NTR Nagar as the Name of Capital City to be formed like Gandhi Nagar of Gujarat. Mostly the Capital Can be formed in between Krishna as well as Guntur Districts only. Central panel recommends either Marutur, Vinukonda or Donakonda as Andhra capital. The New Capital city must be allgood facilities like ground water availability, surface water availability in the basin area, road network, city or town population density, availability of land, airport and seaport connectivity. We have mapped all 13 districts and given the data.